If you love to travel, and stay on your style A game, we have the perfect outfits planned for every type of traveller. Heading off for a European vacation, or cool city break? We all know that some multi-purpose layers are a must-have, it is all about finding those few key pieces to keep you warm and that look chic too. A denim shirt is perfect for this, it looks cool tied around the waist and can also be a lightweight jacket. Add a great pair of espadrilles, and you are good to go. Don’t forget a soft white tee or tank. American Vintage have the best range. If you’ve saved up your vacation days to jet off to a faraway destination, then for this type of trip, lightweight, neutral layers are key. Go for a cotton ankle pant, lightweight tank and a multipurpose jacket. You’ll also want a few accessories – a soft scarf for warmth during early mornings, internal plane rides and of course, not forgetting a hat to shield you from the sun. 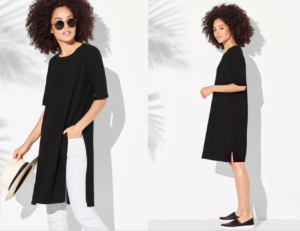 If your family likes to jet away to an exotic island resort, then that means dressing up for dinner, so opt in for an easy-to-pack short-sleeved dress that takes you easily from day to night, from the beach to the bar. 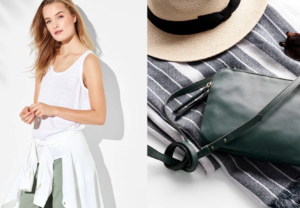 Don’t forget the perfect sun hat, and cute backpack.